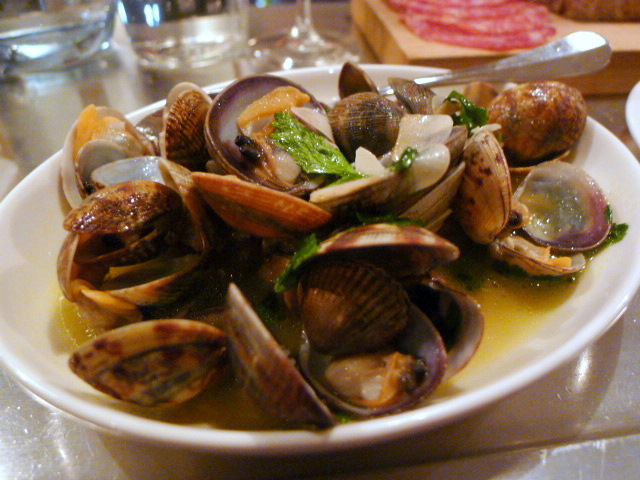 Clams with lemon, garlic and coriander (£8.50) were fresh, but extremely salty to the point of being unappealing. Montbéliard sausage (£12) was wonderfully rustic and full of meaty goodness. 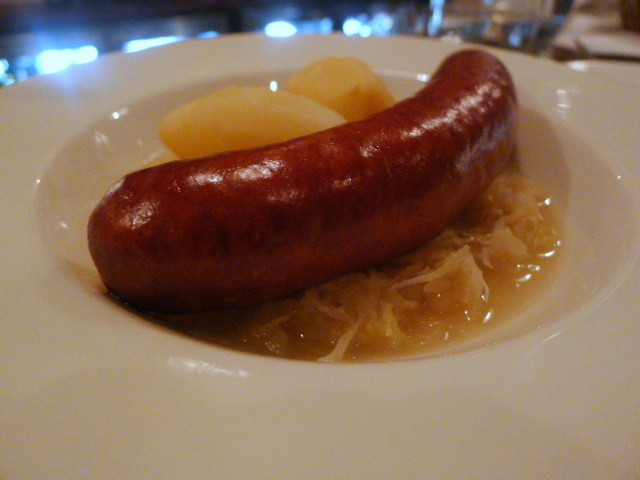 It was accompanied by a well prepared choucroute which was refined, light and tasty. Its delicate hint of acidity worked well with the meat. Despite the fact that the sausage skin was a little tough, this was a highly enjoyable dish. 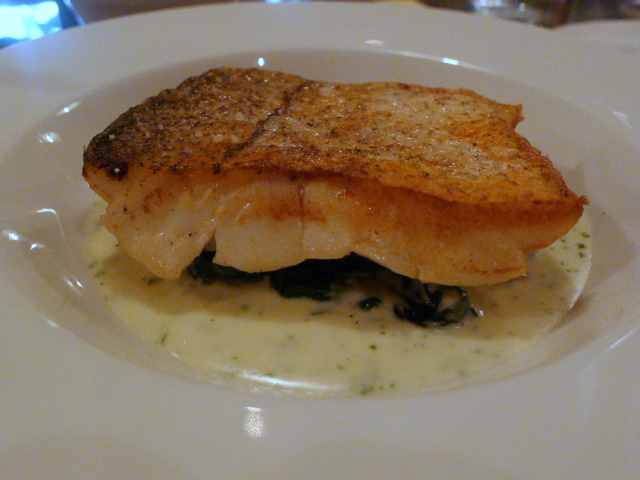 A dish of haddock with spinach (£15.50) was nicely cooked. But it was also inconsistently and slightly over seasoned. The parsley sauce was creamy and tasty and matched the fish nicely. 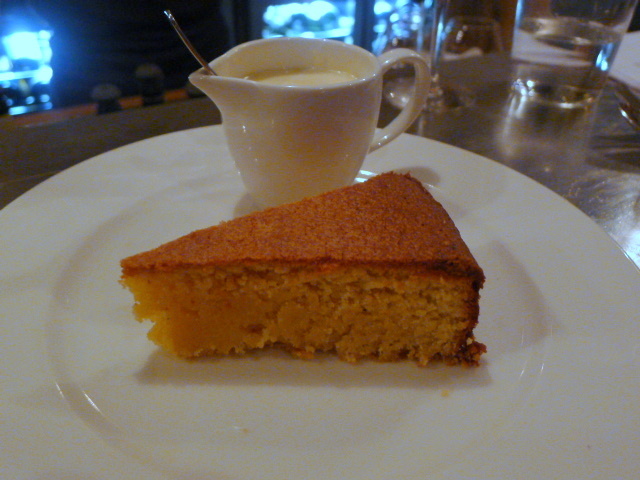 A lemon polenta cake (£7) was moist with a good grainy texture. It had been drizzled with a prosecco zabaglione which was wonderfully creamy and custardy. To me, the excellence of the rillette at Terroirs exemplified what the food at Terroirs was meant to be about – gutsy, powerful cooking that resonated with its audience. 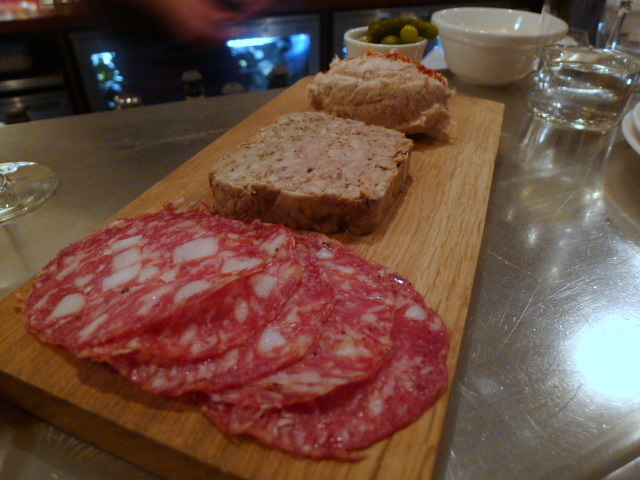 Here at Soif, the rillette was lacklustre, the seasoning, somewhat inconsistent. Soif feels like an attempt to capitalise on the formula that made Terroirs a success but which hasn’t quite hit the mark. Some dishes were good and pleasing, but it wasn’t quite an all round success. But it has its plus points. The pricing is fairly reasonable, the service is charming, and the wine options are varied. And with its relaxed, convivial décor, it serves a purpose in the South London dining scene. It’s good enough, but, (and this is my lament) just not as good as the original when it first opened. Price range: £24 – £36 for one small plate, main and dessert. Great post! It was really good to see you and catch up this week at Umami! It was great seeing you too! Thanks for reading my post and I hope to see you soon.